General Aviation News will often reprint excerpts from National Transportation Safety Board (NTSB) accident reports, including one from October 2010 that involved a Cessna 210 in Aiken, South Carolina, where there was one fatality because the pilot relied on outdated weather radar imagery. The pilot who crashed also did not have an instrument rating nor were there any records of him obtaining a weather briefing or filing a flight plan for a VFR cross-country flight. During the flight, the pilot had been advised by ATC that there was a broken line of weather with moderate-to-heavy precipitation which extended almost to his destination airport. The pilot told ATC that he was underneath the weather plus he had weather radar on-board. According to radar records from the time of the accident, various witness statements and surface station measurements, the aircraft was most likely in instrument meteorological conditions during the final two minutes of flight. Radar data also showed that the pilot’s altitude control became erratic after entering the weather system with the aircraft making ever-tightening right turns – a sign the pilot was experiencing spatial disorientation. The aircraft completed roughly two and a half 360° turns of progressively smaller diameters before impacting terrain. Examination of the wreckage revealed that on-board weather radar was not installed but the remains of a portable global positioning system (GPS) receiver were discovered. However, the receiver was not certificated for use under instrument flight rules and the manufacturer intended for it to only be used as an aid for VFR navigation. The GPS receiver was capable of displaying weather data and images from the NEXt-generation RADar (NEXRAD) ground radar network, but this data was not transmitted in real time with the manufacturer cautioning that the lapsed time between the collection, processing and dissemination of the images could be significant. Moreover, the FAA says that NEXRAD data along with any radar data should not be used to penetrate hazardous weather as its intended to only be used in an early-warning capacity during pre-departure and for en route evaluation. In addition, NEXRAD images consists of radar data from multiple ground sites displayed as a single mosaic image that could be up to 15 to 20 minutes older than the age indicated on the image. For the above reasons, the probable cause of the crash was ruled the pilot’s inadequate weather planning and improper decision to continue a VFR flight into IMC leading to spatial disorientation and a loss of control. Contributing to the accident was the improper use of radar imagery for short-range weather avoidance. 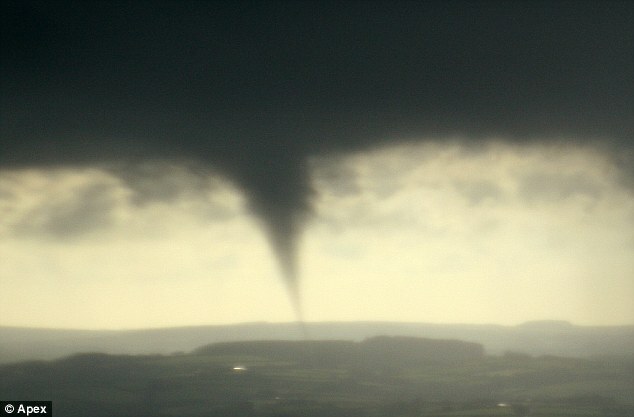 The Daily Mail recently told the story of how a pleasure flight over the British countryside turned nightmarish with a close encounter with a tornado. Apparently a Cessna 150 had taken off from Eaglescott Airfield at Burrington, Devon, with a London pilot named Mark Wagner (who has more than 30 years of flying experience) at the controls and passengers Paul Scantlebury and Terry Gilbert to enjoy views of the North Devon countryside. He said that Mr Gilbert started shouting instructions at the pilot: ‘I clearly remember Terry screaming "Head for the middle of the twister, it’s the safest place. I saw it in a film." ‘The pilot very calmly said, "No, no Terry that’s wrong. "We just have to stay away from it and land back at Eaglescott." The aircraft was able to safely land but the incident also shows how the weather can quickly change from clear blue skies to something dark and menacing that can cause passengers unaccustomed to flying in a small aircraft to panic. Luckily the experienced pilot visibly kept his cool as the last thing a pilot needs to do is anything that would cause passengers to panic even further. General Aviation News will often print excerpts from US National Transportation Safety Board (NTSB) including this June 2009 report about a fatal accident involving a Cessna 182 in Dougherty, Texas. According to the accident report, there was no record of the pilot involved having obtained a formal weather briefing before flying. On that day, weather information showed an area of light precipitation that was consistent with a thunderstorm in the vicinity of where the accident occurred. Specifically, convective SIGMETS and METAR observations along with eyewitness reports noted thunderstorms, dust storms, brownout conditions and the chance of severe to extreme turbulence. Radar data for the last portion of the pilot’s flight showed the Cessna 182 changing headings and altitude several times before nose diving into an open field and fragmenting on impact. The pilot himself had logged 412 hours that had included 45.5 hours in a Cessna 182, 17.7 hours at night and 4.6 hours in simulated instrument meteorological conditions while the subsequent investigation revealed no issues with the Cessna 182’s airframe, engine or systems. Hence, the probable cause of the fatal accident was ruled the pilot’s decision to continue flying into poor weather conditions and his inability to maintain control of the aircraft after hitting a thunderstorm. Other contributory factors were the pilot’s lack of preflight planning and his failure to obtain a weather briefing about the adverse weather conditions present at the time. In other words, always get a weather briefing and if one shows the presence of thunderstorms, consider postponing your flight until conditions improve. Nobody likes to fly through or experience turbulence in the air. Hence, a recent and lengthy post by John Ewing about strategies for avoiding turbulence is well worth reading. John began by noting the importance of first getting yourself thoroughly briefed about weather conditions before taking off and the fact that there are a number of sources of information about the potential for turbulence while flying. Ensure your seat belt is snug and tight (before the turbulence starts). Secure loose items in the cockpit. Slow down to at least the published maneuvering speed (Va) for your aircraft at your estimated weight. When you use the controls, think of dampening out the variations instead of trying to overcome them. Avoid using flaps in turbulence. Be patient and try to stay as relaxed as possible. John also noted that you will be doing your fellow pilots a favor by reporting instances of turbulence but he also pointed out that less experienced pilots who are flying smaller aircraft will frequently over-report the intensity of turbulence plus pilots in more rigid, composite airframe aircraft (such as Diamond and Cirrus) will tend to report a rougher ride that their aluminum-flying compatriots. Hence, John suggested that pilots can avoid over-reporting turbulence by using the objective criteria from the Aeronautical Information Manual, section 7-1-23. Turbulence can become a serious risk factor; it is distracting, it adds to your workload, and it’s tiring. Combine turbulence with instrument meteorological conditions and/or night time and the risks for single-pilot operations only get worse. If you find turbulence scary and uncomfortable, join the club! There’s no shame in being afraid, but there’s seldom any excuse for not anticipating or expecting turbulence. In other words, turbulence can often be managed but there is no shame in delaying or even cancelling a flight in order to avoid it. Not only will you be taking the safest option but your passengers will probably thank you for doing so!